Our recommendations to you when you need to buy or replace your air conditioning and heating system will be customized specifically for you, based on the size of your home, your personal comfort preferences, and your budget. With a full line of name brand, quality products, and equipment, Kobie Complete Heating & Cooling will help you “GET YOUR COOL BACK” quickly and affordably. And we’ll be there for you, to provide regular maintenance and service, helping you prolong the life and efficiency of your new investment. Financing and extended warranties are available to qualified buyers. Kobie Complete is pleased to carry air conditioning products from the following manufacturers. Please click on the links below to view our most popular products. TRANE – Kobie Complete is an official Trane Comfort Specialist. Reliable, and Extremely Durable these are words that describe your new TRANE comfort system, installed and maintained for you by Kobie Complete. YORK® – YORK® residential heating and cooling systems are designed, engineered and assembled in the United States. With a complete line of YORK® products to choose from, there’s a system perfectly suited for every environment. Comfortmaker – Air conditioning and heating products that offer comfort with confidence for homeowners and homebuilders for replacement, retrofit and new construction applications. LENNOX – providing you with the most quiet, energy efficient products available. How many companies do you know that have been in business over 100 years? LENNOX, a name you’ve come to know and trust. 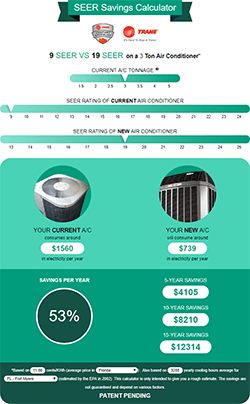 Amana® – premium, high-quality line of air conditioners and heat pumps considered to be among the most energy-efficient in the marketplace installed for you by Kobie Complete. Goodman – Kobie Complete is proud to bring you, Goodman, one of the largest manufacturers of residential air conditioning and heating products. Did you know that significant savings are to be had when upgrading from a lower SEER system to the newest energy efficient models? Kobie Complete provides an exclusive energy savings calculator to its website visitors which is a great tool to project your long term savings when upgrading equipment.